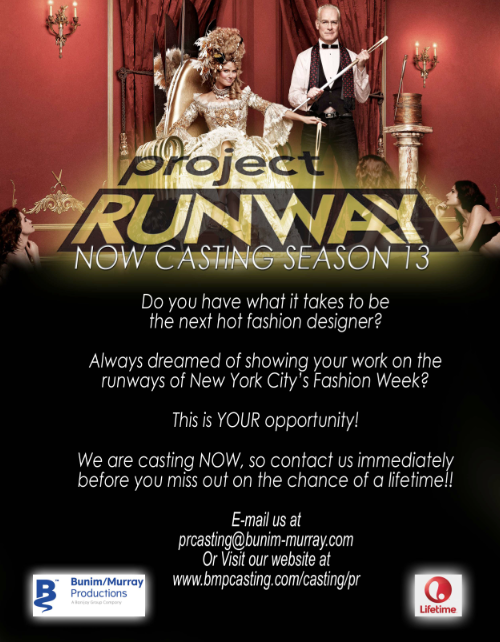 Fashion Design Blog: Project Runway is now casting for Season 13! Project Runway is now casting for Season 13! We're excited to offer designers the chance to show their work during New York Fashion Week, and the opportunity to win $100,000 to launch or expand their own fashion line. If Project Runway isn't for you, we’d love to hear which local designers are on your radar. Please feel free to send out our attached flier and website out, via your email list, Facebook, Twitter—whatever you think is best to reach your community. We value your help as we search for the best talent in fashion design. Please note, the financial cap to qualify for the show has been adjusted, and if you were not able to apply in years past, you may be eligible now. Learn more and download the application here. The application deadline is APRIL 14th 2014.